If it's December, it's time for the major ballet companies of the UK to dust down their party frocks and fetch the baubles from the attic for the Stahlbaums' annual Christmas festivities. The Nutcracker has become as much a part of Christmas as mistletoe and mulled wine – and even if sugarplums are slightly thinner on the ground than in past years, with just two competing Nutcrackers in town from the Royal Ballet and ENB, the piece remains the classical world's festive treat par excellence. ENB dances Wayne Eagling's version of the story, the creation of which was agonisingly depicted in the BBC's Agony and Ecstasy docu-series in 2011. It's easy to see why, in a nut-heavy market, Eagling felt the need to update the story and structure – but not all of his updates are improvements. First, the good: a super-cute cohort of young dancers from the Tring Park School enlivens the first act. Micaela Infante is suitably pink-cheeked and perky as young Clara, and the children bring a real energy and vivacity to what can in traditional productions be a rather stodgy first half. The changes of scene, from the interior to the outside of the Stahlbaums' house, add welcome texture to the opening scenes, and add a dash of wintry magic in the form of passing ice skaters. The party scene is full of lively interactions, introducing Clara's sweet crush on the neighbourhood heartthrob (Vadim Muntagirov), and the snowflakes (led by Laurretta Summerscales) are sublime. The bad is chiefly scattered through the second half. The decision to remove Clara and the Nutcracker Prince from most of Act 2, and to replace them with a swishing red curtain that closes between each of the confectionary-themed divertissements leads to a fatal drop in energy between each number and a lot of dead space on stage. The Spanish and Russian dances are charming enough – Adela Ramirez looks like she's born to her fan-waving flamenco, and Ken Saruhashi receives loud cheers for his leaping Cossack. The Arabian dance, always a problematically orientalist pastiche, here becomes a fetishistic display of harem slavery that offends both gender and geopolitical sensitivities. The decision to reintroduce Clara onstage as the Sugar Plum Fairy, meanwhile, borders on the baffling -– it's one thing for a child to dream of sweets at Christmas, but for her to actually become one is a step towards the wrong kind of nutty. Muntagirov and his adult Clara, Daria Klimentová, are both excellent, and the corps are in fine form as party guests, snowflakes and waltzing flowers. The Nutcracker will always be a festive sweet treat, but unfortunately ENB's version disappoints on almost as many fronts as it delights. 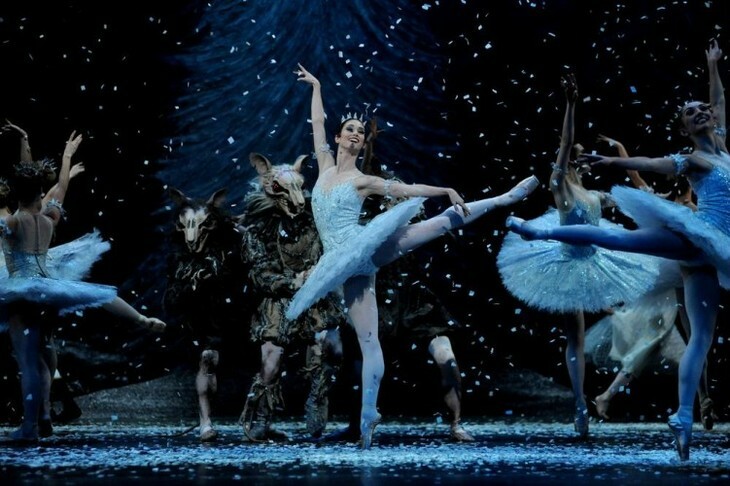 English National ballet perform The Nutcracker at the London Coliseum, WC2N 4ES, from 11 December-5 January 2014. Tickets £25-£74.50. Londonist saw this performance on a complimentary review ticket.